Ed was born in Fulton, NY and raised in Mexico, NY on a 150-acre dairy farm. There he developed a love for the outdoors, God’s wonderful creation, and for serving and working as an extended family. As a child, Ed attended Methodist churches in Fulton and Mexico. In January of 1976, a teen friend invited him to visit the Oswego Church of Christ. As a result of that visit, Ed began attending the Oswego church regularly and was immersed into Christ in April of that year. Ed graduated from Mexico High school in 1981 and went on to earn an A.A. Degree from Northeastern Christian Junior College (1983), B.A. Psychology from Oswego State (1989), M.S. Ed. Communication Disorders (1990) and a Master of Divinity in Christian Ministry from Amridge University (2007). Ed married Jeannie Himes in June of 1984. They have three adult children (Sarah, Rachel, and Andrew) who have given them two wonderful sons-in-law, a wonderful daughter-in-law and four amazing grandsons. Ed and Jean worshiped with the Oswego Church of Christ for over 35 years before moving to the Wetzel Road Church of Christ. 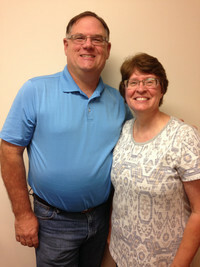 Ed and Jean are now retired from full-time teaching in the public schools but still LOVE working with children. They teach Preschool Bible classes together at church, adult in-home Bible studies, and serve with the Wetzel Road congregation and at Camp Hunt.